Measurements: 2.37 x 4.25 inches, or 60 x 108 mm. Back of card: White with pale green printing. In the center, an indeterminate young person looking right but pointing left. On the bottom of the card the word, "ETRURIA". Not a symmetrical back, but due to the low contrast of the printing, these may be inverted. Booklet included: Yes, a long folded sheet of paper with 16 panes. Each pane measures 2.4 x 4.35 inches, or 60 x 108 mm. Comments: I had a brainstorm one day & realized the Major arcana cards were much younger than the minor arcana (pip, or playing) cards. While there is no way to know this beyond doubt, this deck tends to support my hunch. The Italians are perhaps the most creative nation on earth. In this list, pretty much all the usual major arcana cards, but not in the usual order. In addition, the four elements, the four graces & the twelve signs of the zodiac. Compare this to the Sola Busca Tarot with its unique -and different - slant on the major arcana. We like to think that tarot was always fixed with 22 major arcana cards, but this is not so. It may be that most of the early decks had the usual 22 cards with more or less the same names & in more or less the same order, but this was not always true. It may be that the 22 standard major arcana cards became standard merely from mindless copying. If a 78 card deck is already popular, why not copy success & guarantee the outcome of one's efforts? The world has always copied success, then as now. What is unchanged from deck to deck are the 52/56 ordinary "playing" cards. These did not change because everyone knew what to expect, meaning that the suits & numbers were fixed far earlier. Such, at any rate, is my hunch. 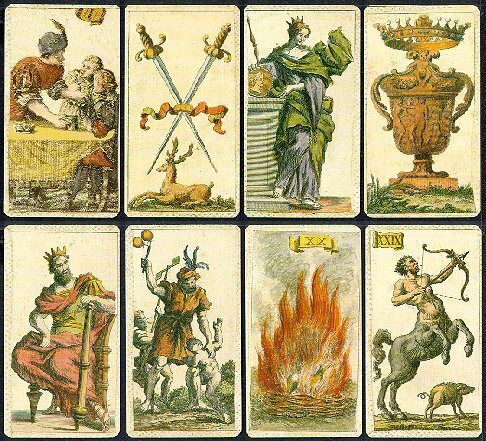 The cards in the second line, above: The King of Wands, the Fool, Fire, and Sagittarius. If you use these cards in a reading, let me know how you do it. See also Brian Williams's reworking of this deck at The Minchiate Tarot Deck & Book Set. The book that comes with the set is highly recommended & can be profitably used with the original cards shown above.